The “Welcome Birders” signs are up and our little community is ready for an influx of people with binoculars and cameras slung around their necks. Soon, all eyes will be on the stars of the spring migration – the tiny warblers who stop along Lake Erie’s shores on their way north. This year, however, birders here for the Biggest Week in American Birding will be seeing a plethora of signs other than those welcoming them. These bright-yellow placards are promoting our community’s effort to stop the dumping of spent lime sludge in a local limestone quarry. Those of us engaged in this David-versus-Goliath fight are hoping to build awareness and elicit additional support from the birding community. 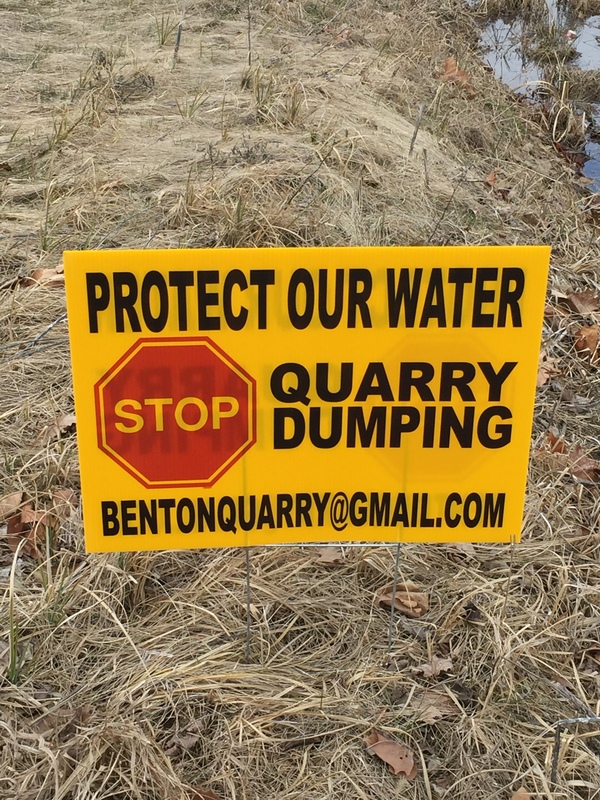 The threat that the quarry dumping poses is something no one in Ottawa County’s Benton Township ever expected to face. Most residents here are occupied with farming, other work, and maintaining their property, even as they enjoy their bucolic location near one of the prime birding spots in the country. Still, because people here are responsible for their own water and sewage via private wells and septic systems, they know what it takes to maintain them. Hence, local conversations of late have been peppered with talk of “the aquifer” that feeds our wells and what effect the dumping of spent lime might have on it, given the sludge contains copper, lead, arsenic, mercury, cadmium and other metals and substances. Lacking a municipal department that manages our water supply, we have banded together, driven by concern for our wells and a love of the area once known as the Great Black Swamp. Interestingly, the problem we face involves drinking water in another community – an urban one. The city of Toledo in neighboring Lucas County made national headlines nearly three years ago when toxins from the algae bloom on Lake Erie compromised the city’s water, leading to the temporary shutdown of the municipal water-treatment plant. To prevent a recurrence, Toledo began making changes that included removing from lined lagoons the spent lime used to clean its drinking water and relocating it elsewhere. Enter an enterprising company, which bought a quarry in Ottawa County and arranged for one of its affiliates to haul and dump the sludge under terms of a multi-million-dollar contract. Rural Benton Township must have seemed the ideal setting for this operation. Unlike in the city, the proceedings of the governing trustees are not reported in detail by local news outlets. Also, unlike more densely populated suburban neighborhoods, where people take note of everything from the grass-cutting habits of their neighbors to a for-sale sign going up, rural dwellers are more likely to look out their windows and notice an eagle or Northern Harrier soaring over a fallow field. So it happened that few of us even realized what was going on at the quarry until last year when the persistent efforts of a neighbor who had observed the activity and tried to raise the alarm finally captured everyone’s attention. Since then, residents have organized and educated themselves about what exactly the dumping of spent lime sludge in and around the quarry could mean to these environs and most especially the drinking water. They’ve learned what the state Environmental Protection Agency can and cannot do, what local zoning laws mean, about other communities that have faced and successfully fought similar threats, and how to get the message out to news organizations. They’ve had signs made and set up a Facebook group and a website that includes a link for donations to help pay the hefty legal bills the township has had to absorb to counter the dumping. Along the way, people have gotten to know each other a little better, setting aside what differences they might have for a unified effort to protect their water. They’ve discovered that many of their neighbors share an interest in the birds that draw visitors to this area each spring and that they want to do what they can to ensure Benton Township continues to provide a friendly habitat for wildlife as well as people. In listening to the commentary at township meetings over the last months and interacting with our neighbors, it often has struck me how those of us who live in rural areas value the peace, spaciousness, and proximity to the natural world we find outside the city. Yet, these very qualities make our environs vulnerable to outside forces that would exploit what we treasure. It is a good reminder to all of us to keep watch and stay vigilant, even — and perhaps especially — in the quiet.